i've always believed in the benefits of travel - whether exploring a new place or returning to a beloved familiar one - and encourage all of us at kai to do so. it's amazing how we feel recharged and reconnected afterwards. i recently shared my family's trip to the british virgin islands, now chloe is taking us with her on her charming holiday to martha's vineyard. i'm ready for one more summer getaway to the east coast -- who's joining me? ﻿traveling from the west coast to the east coast is not an easy feat -- a redeye, a four hour layover at JFK, and a nerve-racking flight on a very small plane. yet, our 24 hours of travel were well worth it for this unwaveringly charming island. free of highways, traffic lights, and cell phone service martha's vineyard makes for a perfect vacation. our days consisted of rising with the sun and breakfast with a view where we watched the fisherman gather the catch of the day. lazy mornings at the beach filled with walks along the clay cliffs and body surfing were followed by bike rides to menemsha for the freshest oysters and clams i have ever had. an outdoor shower with a view of the island's lighthouse and my kai travel set allotted for some quiet time before sunset drinks and lobster dinners. the vineyard could not be more beautiful with its sprawling green landscape, quaint harbors, and gray cedar shake homes and stores. however, like anywhere you go, the company for this week's vacation was the best part. 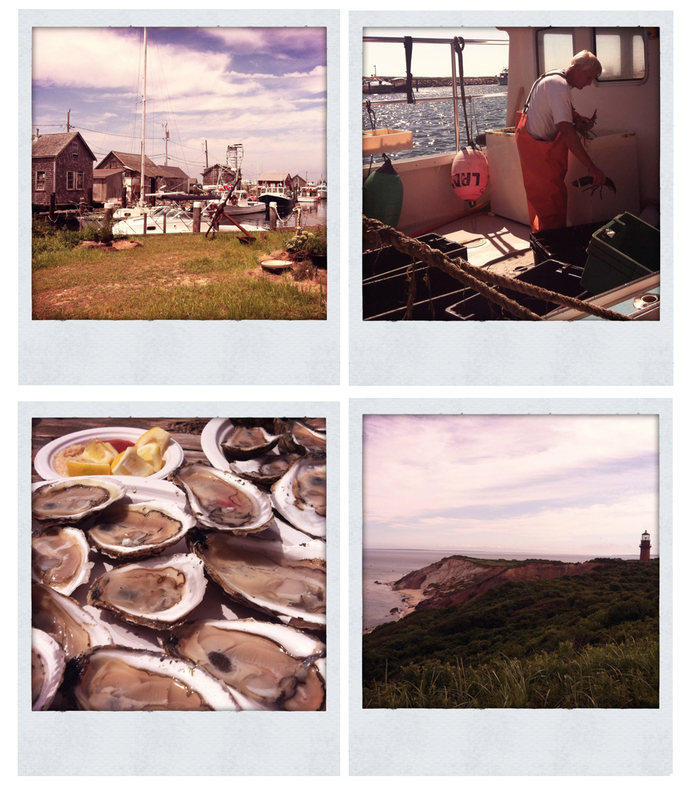 love, laughter, and lobtser is how i will think of my first (definitely not last) trip to the vineyard.